It's an oldie, but a goodie. This is an exercise I have used as an ice-breaker/time filler at training sessions and events and have also tried it out on my teenage children with different results from each of them. You will need a piece of paper (any colour, any size) and a writing implement (crayon, pen, pencil). 2. Put your name in the upper right-hand corner of the paper. 3. Draw a circle your first name. 4. 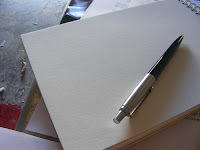 Draw five small squares in the upper left-hand corner of the paper. 5. Put a X in each square mentioned in number 4. 6. Draw a circle around each square. 7. Sign your name in the centre of the page. 8. Under your signature write, 'yes, yes, yes'. 9. Draw a circle around the first 'yes' and the third 'yes'. 10. Put an X in the lower left-hand corner of the page. 11. Draw a triangle around the X that you have just written. 12. On the back of the page multiply 70 x 30. 13. Draw a circle around the answer. 14. Loudly call out your name when you get to this point in the test. 15. If you think that you have carefully followed instructions, call out... "I have carefully followed instructions". 16. On the back of the page add 107 and 278. 17. Underline your answer twice. 18. Count in your normal speaking voice from 1 to 10. 19. Clap your hands three times. 20. If you are the first person to get this far, call out... "I am the leader in following instructions". 21. Now that you have finished reading carefully, do only questions 1 and 2.